Scleroderma (synonym dermatosclerosis) is a progressive disease characterized by thickening of the skin, and at the systemic nature of the process and the defeat of the internal organs. On the distribution process scleroderma is divided into the system when affects many organs and tissues, and limited, that offers mainly local changes of the skin. The disorder is based on changes of connective tissue, in particular collagen fibers, with the development of sclerosis and occlusive lesions of the arterioles. Systemic scleroderma (synonym: universal, generalized, diffuse, progressive scleroderma, systemic progressive multiple sclerosis) is a severe disease with polymorphous clinical picture, including the skin, joints, internal organs (heart, lungs, digestive tract, kidneys), on the background of vascular and trophic disorders. Systemic scleroderma is referred to the group of collagen diseases (see) or diffuse diseases of connective tissue (the item's who). In the etiology may have the value of genetic and infectious factors. Known for provocative role cooling, injuries, chronic infections and intolerance of drugs, endocrine changes (abortion, childbirth, menopause) and other Pathogenesis of the disease is complex and poorly understood. Great importance is attached pathology of collagen (an increase of biosynthesis and fibrillatory) and immune (autoimmune) violations, unfolding against the background of the changed regulatory functions of the nervous and endocrine systems. Fig. 1. Diffuse scleroderma (masloobraznyj person). Fig. 2. Sclerodactylia (sclerodermataceae skin brush). Clinical symptoms. Ill mostly women, mostly aged 20-50 years. The disease usually develops slowly: there vazomotorne violations by type of Raynaud's syndrome (numbness and whitening or blue fingers), arthralgia, dense swelling of the skin, at least - the defeat of the internal organs. 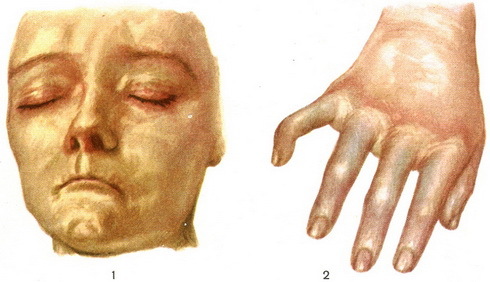 The defeat of the skin, passing the stage of edema, seals and atrophy, is noted in most patients and localized primarily on the face (the mask-like appearance) and hands - sclerodactylia (Fig. 1 and 2). Often there are hyperpigmentation of the skin and telangiectasias on the face and chest. The symptoms of Raynaud's syndrome may be accompanied by the marked trophic changes, re-ulcerations at your finger tips; sometimes developed gangrene of fingers. Articular syndrome from light arthralgia to severe deformity of the joints with the development of persistent contractures is observed in most patients. Some patients with systemic scleroderma noted the accumulation of salts of calcium (calcification) in the subcutaneous tissue of the fingers and periarticular tissues syndrome Tiboria - Weissenbach. Many patients have osteoporosis, but especially characteristic of survivorship nail, and sometimes and middle phalanxes of fingers, rarely feet, shortening and a corresponding deformation of fingers. Lung damage is marked in the majority of patients and is characterized by the gradual development of basal (compact, less cystic) of pneumosclerosis. There myocardial damage as a focal or diffuse cardiosclerosis; rarely affected the endocardium with the formation sklerodermia, most of the mitral valve of heart disease, there have been changes pericardium. The defeat of the gastrointestinal tract (most of the esophagus) occurs in about half of the cases and is characterized by impaired swallowing, heartburn, abdominal pain, persistent constipation, and sometimes diarrhea. The kidneys are affected relatively rare, but in acute and subacute disease may develop acute renal failure. Often disrupted by the endocrine (thyroid gland, sexual glands, adrenal gland) and nervous (more peripheral and vegetative systems. Problem of hair loss and significant weight loss (10-20 kg and more). Quite often see hyperproteinemia; in acute and subacute disease - accelerated ROHE, positive difenilamina test and other signs of activity of the process. Depending on the speed of progression and activity of the process there are acute (occurs very rarely), subacute and chronic course of the disease. Prognosis in acute and subacute forms of scleroderma more unfavorable for chronic much better. Treatment. In acute and subacute during treated with corticosteroids, preferably prednisolone, long-term (months, often years). Assign product by 20 - 30 mg / day with subsequent dose reduction. Concurrently use derivative aminoquinoline - hingamin (chloroquine, delagil, Raskin) 0.25 g after dinner, sometimes salicylates (often acetylsalicylic acid 2-3 g per day), repeated courses of vitamins B1 and B6 intramuscularly (spring and autumn). When violations of peripheral blood circulation and trophic - repeated courses of amiotrofia 1 ml for 10-15 days or depopulating 1 ml for 30 days intramuscularly; disodium salt adenosine-triphosphorous acid 1 ml of 1% solution intramuscularly in a month; in the juxtaposition of secondary infection - antibiotics. In chronic forms of scleroderma also use these funds, with the exception of corticosteroids; besides, the re-treatment courses lidz 64 IU in 1 ml of 0.5% solution novokaina subcutaneously every day, 12-14 injections per course. Appoint electrophoresis with hyaluronidase, paraffin baths, balneotherapy (hydrogen sulphide, radon bath), massage and physical therapy. Prevention of systemic sclerosis is a reasonable tempering of the body, with the exception of precipitating factors, employment patients and systematic observation with the purpose of maintenance therapy, relapse prevention and further generalization of the process.